Able to administer a variety of vaccines. 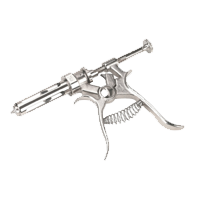 This Sharpvet model has a bigger barrel and a shorter piston to accommodate smaller hands and are equipped with either a threaded or luer lock feeding nozzle. 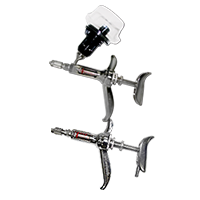 The syringe is comfortable and reduces hand fatigue. Virtually unbreakable, these nylon syringes have centered tips with luer lock and or luer slip adaptors on all sizes except for the 100cc (off centered). Graduations are etched in black for long lasting visibility. 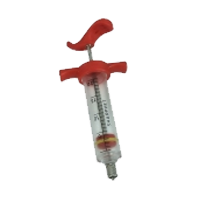 Dosage syringe for multiple dosing of live stock. 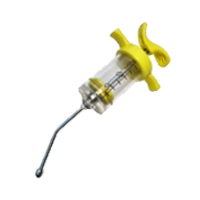 Whole syringe can be dismantled. Via 0.5 ml (10ml/30ml) or 1ml (30ml/50ml) dosage wheel. High quality for long service life. A design which has been proven for decades.